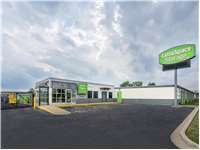 South Holland Self Storage at 175 W. 162nd St. Located on W. 162nd Ave. between Vincennes Ave. and State St., Extra Space Storage serves residents of South Holland, Phoenix, Markham, Harvey, Thornton, and East Hazel Crest. Locals will recognize our facility across from Wendy's next to Pat Fitzgibbon's Mitsubishi. We're also accessible for residents of nearby apartments, such as St. Andrew Manor Apartments, Garden House of River Oaks, Sandridge Apartments, Ginger Ridge Apartments, Kings Crossing Apartments, and Superior Oak. With a wide selection of storage units and amenities like climate-controlled storage and vehicle storage, Extra Space Storage on W. 162nd Ave. is the secure storage solution for you in South Holland. Our W. 162nd Ave. facility has storage units ranging in size from 5x5 to 10x30 with features like first-floor access, drive-up access, climate control, and outdoor vehicle parking available. Protect temperature-sensitive items by renting a climate-controlled storage unit. These units maintain an environment between 55°F and 85°F at all times to prevent damage caused by extreme heat or cold. You can find units with climate control in sizes 5x5 to 10x20 at our South Holland facility. Need secure vehicle storage in South Holland? Extra Space Storage has 10x15 outdoor parking spaces and drive-up units in sizes 7x10 to 10x30 to accommodate vehicles of all sizes, from motorcycles to RVs. Creating an excellent self storage experience for our customers is a top priority at Extra Space Storage in South Holland. Not only do we offer great storage amenities, but we're dedicated to maintaining a secure, clean facility and providing helpful customer service. Contact us today to reserve a storage unit! My name is Janice and I have been a customer at the South Holland,Il locations for more years than I can mention. I just want to let you know how wonderful KiKi is in solving problems, answering questions/concerns and just being such a beautiful person in general. She is always so friendly on the phone, even when she is calling to collect the storage fee!!!. You never think you can develop a friendship, from a storage facility, but I feel I have. You should truly cherish her as one of your loyal employees. She is a keeper. Also this facility is always so clean and well kept. During the four years, at this storage in South Holland, the facility personnel was always accommodating and friendly. Will recommend this facility always! If you want a storage facility and staff you can trust that cares about your belongings as much as you, come to Extra Storage in South Holland. Ask for Ki Ki she has awesome customer service and knowledge of the facility. She made a stressful experience a great one! I'm satisfied with the service straight across the board.I will highly recommend extra space storage to everybody thats,looking for stogie space. The south holland location provided me with all that I needed. Great customer service representative. Kiki was a pleasure to work with. She gave excellent information and answered all of my questions. Kikki was great she made me feel safe leaving all my personal belongings the process is easy,good location and easy access. I have used this location twice. Great rates; easy rental process; safe and clean area for storage. Best of all, the professional, informative Ke Ke! Employees are very nice nd respectful nd understanding willing to work with you..The area is very secured with cameras so I know my things will be safe there.. The facility is clean, easy access and convenient. The process for securing the unit was quick and painless. The lady provided excellent service and ensured that my business was secured with this company. They raise the rent more than once every twelve months. Raised my rent 12/1/2014, and again 9/1/2015. It seems that I will have to just take a final loss-just let everything go. Its just too expensive to hold on to. The representatives at this loaction have been very helpful since we have set up this account. They have assisted my mother over the phone and in person. They have yet to tell us no, instead they say let me see what I can do and they try to find solutions for the customer. All the young ladies have been helpful and I do not have their names but my most recent service was from delia and she was great. This is the best place for one's storage needs. They are much better than Public Storage and all other storage facilities. Extra Space Storage is very, very clean and the storage spaces are spacious at reasonable prices. Sometimes, they have specials, thereby giving you an opportunity to save money! I highly recommend this facility. Most impressive, she turned up at past 10 at night to let us in the facility without prompting her. This facility has excellent customer service! They are always very helpful and courteous. Facility and units are always clean, storage unit is almost always accessible. Facility is also very secure. I would definitely recommend! I WOULD PASS ON TO OTHERS HOW GREAT EXTRA SPACE STORAGE IS TO THEIR NEEDS. All good, very pleasant location within walking distance if and when I choose to walk. I will use the storage again anywhere in the country. i been with my facility for two yrs an an the facility is great location, cleaness, an safe. I HAVE HAD A PLEASANT EXPERIENCE THUS FAR WITH THIS FACILITY AND IT HAS BEEN ALL AND MORE THAN I EXPECTED. The Extra Space Storage facility is always clean and equipment is always available to help the customer with his or her move in and out. The facility is well lit and secure unlike other facilities that I have used in the past. The room to drive up to his/her unit is also a huge plus because I do not feel crowded by others doing the same thing that I am doing. There is enough room for everyone to do what they came to do. I will continue to use your facility for those reasons. Thank you. Drive south on S Halsted St. Pass Walgreens and continue straight. Turn right onto IL- S. Turn left onto E 153rd St. Turn right onto Vincennes Rd. Continue onto Vincennes Rd. Turn left onto W 162nd St. Our facility will be on the right after Suntone Dr.
Drive north on S Halsted St. Pass The Home Depot and continue straight. Turn right onto E 159th St. Pass Vincennes Ave and continue onto W 162nd St. Our facility will be on the right after Suntone Dr.
Drive west on US-6. Pass Dunkin’ Donuts and continue straight. Turn right onto La Salle St. Turn left toward Suntone Dr. Turn left onto Suntone Dr. Turn left onto W 162nd St. Our facility will be immediately on the right. Drive east on US-6. Pass S Halsted St and continue straight. Our facility will be on the right after Suntone Dr.